I bought a Dishwasher Alert years ago, pried it off when I moved, and stuck it on the new dishwasher. When I moved again, some years later, I left the old sign behind and bought a new one. I don't know why it isn't in my latest Miles Kimball catalog. I'm so glad I found it online at mileskimball.com. Dishwasher Alert is perfect for when the dishwasher has already been opened, but not emptied. I might go into the dishwasher to get a clean glass, for example, and that little "Clean" light goes off on the dishwasher's display. This low-tech sign serves as a reminder, "Don't put dirty dishes in here." I don't run the dishwasher every day, so I rinse the dishes before loading them into the dishwasher to keep it from smelling bad. Unless it's almost empty, (indicating that it was recently unloaded), looking inside doesn't tell me if the dishes are clean or dirty. Thank you, Dishwasher Alert. I had one of these that lasted for years. I really missed it when I got a new dish washer. I am so happy to have one again. I really appreciate knowing without looking to see whether my dishes are dirty or clean. There are only two of us in the house, so sometimes it is days before I am ready to wash dishes. Now we don't have to stick a note on the dishwasher every time we have clean dishes in it! It works great--adhesive sticks well and so far the kids haven't messed with it because it looks natural on it. These make good stocking stuffers at Christmas. Delighted to find another one of these after moving! It's SO convenient--almost can't live without it, especially if you're at all absent-minded. Never guess if your dishes are clean. I have been looking for something like this for so long and it doesn't take up much room. I love it. I really needed this product. It reminds me when the dishwasher has a full load and is ready to run. This is a really cute way to keep track of what's in the dishwasher. It's a nice design and easy to use. Since I live alone and don't cook big meals often, I sometimes forget if the clean-looking dishes in the dishwasher are dirty ones I've "stored" there of if they're clean ones I haven't removed yet. The only way to make this better would be to make it magnetic rather than stick-on. I had one of these at my previous house and had to leave it behind for the new owners. Getting another one was my first purchase for my new home. A simple, inexpensive little item that makes me happy every time I use it. This is the second one that I've bought of this. I replaced my dishwasher, but couldn't get the old one off the dishwasher. So I ordered another one. It's so simple to use - just push it to the left or to the right. It is great for what it is . . . to remind you when the dishwasher is clean or dirty! I love it. Easy to put on, just peel and stick. Now my husband has no excuse as to why the dirty dishes can't go in the dishwasher, lol. Great idea. Will reorder for stocking stuffers! Great idea. Wish it was magnetic but holding so far. Will reorder for stocking stuffer gifts this Christmas! One of the greatest inventions I've seen. A wonderful product. In the past I have been using sticky notes saying "Clean". Now with this product all I have to do is slide the product to either clean or dirty. I'm going to tell everyone I know about this little jewel. Had a reminder on the old washer for years. When we got a new replacement we had to get a new reminder. My family couldn't function without knowing if dishes are clean or dirty. Had 4 years LOVE IT gave to my kids as well. My daughter-in-law saw mine several years ago, and has wanted one. This is the first time I have seen it since I have been searching for the product. It is slightly smaller than the one I have (which was purchased over 18 years ago, but for this product it really doesn't matter. I put this little reminder on my laundry basket instead of the dishwasher. Now when put the dirty laundry into the basket I set the reminder to "Dirty." Then when I take the clean clothes out of the dryer I set the reminder to "Clean." This is especially helpful when more than one person in the house does the laundry. Just got a new dishwasher installed, so am ordering this dishwasher alert for new dishwasher. I've used these for many years and greatest invention there is. I recommend these to everyone. Thanks for this fantastic item. Discription should tell how it attaches. I was tired of finding dirty dishes in with the clean dishes I left running the night before and the first person up stuck their dirty breakfast dishes right in with the clean ones. I have used this item on my dishwasher for years & really like having it. We got a new dishwasher and needed a new one. Everyone in the family and many friends have this item now, too. This is an easy and attractive way to let others know whether the diswasher needs to be emptied or if it is being loaded. I used to have one at my previous house and I had to search for another one, now that I moved. It looks great on my stainless dishwasher, but also went well on my old white one I left behind. If you don't want to use the peel and stick, you could always use a magnetic strip - but I prefer to adhere it directly to the dishwasher so it stays put. We recently moved and we greatly miss the dishwasher alert we had on the dishwasher in other home. So glad to find them again. Am ordering another and telling all email friends about the product. Makes life easier for us senior citizens and people of all ages. Thank you so much for keeping it in your internet catalog. How can I do without this? This simple gadget is a great idea. 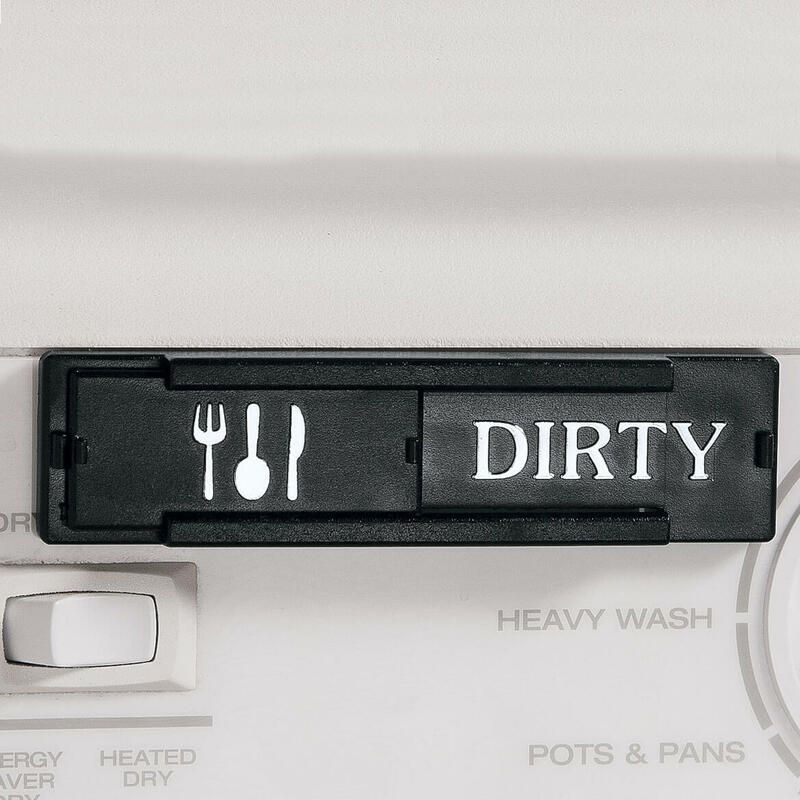 It lets everyone know the status of the dishwasher and stops all the yelling back and forth- "is this clean or dirty??" I love the fact this is not a magnet - it is a peel and stick and was extremely easy to attach to the dishwasher without having to find a spot that was magnetic. Now everyone can see if the dishes are clean or dirty at an easy glance. For old folks it needs more contrast. Very nice with a classic look. I have a black dishwasher. This sign is also black. It's hard to see, but with a bit of effort it has saved us re-washing dishes because we couldn't remember if they were clean or not. Classy looking. I really liked the idea of this. But I did not like the idea that it was not a magnet. All I did was take a strip of the magnet that you get from many places pull off the paper on it. Then I attached the sticky strip to the magnet. Works great. My dishwasher is made so that my family could never tell if the dishes were clean or dirty and often dirty ones ended up in with the clean ones. This helpful little gadget solves that problem beautifully! The little sign is very easy to attach and it is easy to slide it from clean or dirty. The fact it is adhesive means you don't have to worry whether or not the dishwasher is actually magnetic. The only downside of it being adhesive is it be hard to remove, so you want to get the placement down right the first time. Time will tell how long it stays up, but it seems to be solidly placed. My mom actually used it to open the dishwasher, which probably isn't a good idea, but it held so it is fixed on there well. I bought it simply because I got tired of asking clean or dirty... as long as it is used the sign will do just that. Not a new idea but a great gadget. I thought it was a magnetic strip but it is a stick on. I decided to go ahead and keep it as this identical gadget was reviewed elsewhere and was highly recommended. I was afraid the heat from the drying cycle would compromise the integrity of the sticky backing but so far it is adhering very nicely. In fact, it would probably take off the surface finish of my control panel if I tried to pry it off. It looks very nice right in the center of my control panel which is black and the silver lettering of Clean/Dirty complements the stainless steel dishwasher door. Based on good reviews from another website regarding the sticky back, I kept this gadget and also recommend it, especially for black or stainless steel-looking doors. While this is not a new idea, it is a great one. A simple device, easy to remember to use as it is located right there and stops accidental mixing of clean and dirty dishes. When I have company they do not have to ask "clean or dirty" they just read my notice. 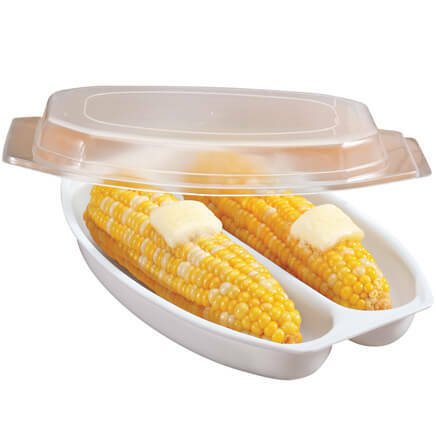 Easily attached and lets me know when to add more dishes. Attach it to the dishwasher so I know when the dishes are clean or dirty. I bought this for my sister. I wash dishes by hand but she has a larger family and dishwasher is used often. Now everyone knows if dishes are clean or dirty. And it stays put, does not fall off when you open / close the dishwaseher door. I bought the Alert to clear up the guesswork on the status of dishes in the washer. Were they clean or dirty. The alert easily took the guesswork out of it. I can't imagine my kitchen without this. I've been using these signs on dishwashers for years. We also have these on the sterilizers in my dental office. When a staff member turns on a sterilize cycle, she moves it to the "Clean" side; as soon as it's unpacked, and therefore ready to accept used instruments, it gets flipped to the "Dirty" side. While the instrument packets change colors when they are sterilized, this is a quick way for staff to see what's inside. Dishwasher Alert is great for my large family. No guessing if dishes are clean or dirty. I think all my children have them on their dishwashers. This is really helpful. Anyone can tell the state of the dishwasher without having to ask. It also fits my dishwasher panel perfectly below the handle without obscuring the settings or brand name, and since my dishwasher is black it matches. Good way to know if the dishes in dishwasher are clean or dirty. I have one that I do not like, thought this would be easier to read at a glance. We have a new dishwasher and the panel is not lit and is hard to read the words under the lights, hopefully this will help and I will get a hand in the kitchen! This should help avoid confusion when using the dishwasher. Hoping husband will read it! Been looking for one of these for my daughter finally found one. I have a reminder on my dishwasher and my kids always say they need one of those. So I am getting one for. My kids and my married grandchildren. Since I always rinse my dishes before using dishwasher. I'm not always I'm sure if items have been washed or not. Sounds like that ad on TV. Why have a dishwasher? Sometime I can't remember if the dishes have been washed or not. I want my husband to stop asking me if the dishes in the dishwasher are dirty or clean!! It will help with that unanswered question, did not get a dishwasher till I was 65, kitchen redo, now they whole family will know. I chose this item so everyone could know the status of the dishes in the dishwasher. To inform other members of household of status. It is a classy way to remember when dishwasher has clean or dirty dishes. No more guessing. We keep asking each other if dishes are clean or not this will help. its so nice and neat. I have a paper note I use right now. easy to change from clean to dirty. right now we have 2 magnets we have to interchange. Easy way for everyone to know if dishes clean or dirty. Too many times someone takes dishes of clean dishwasher without emptying it and no one knows if rest are dirty or not! 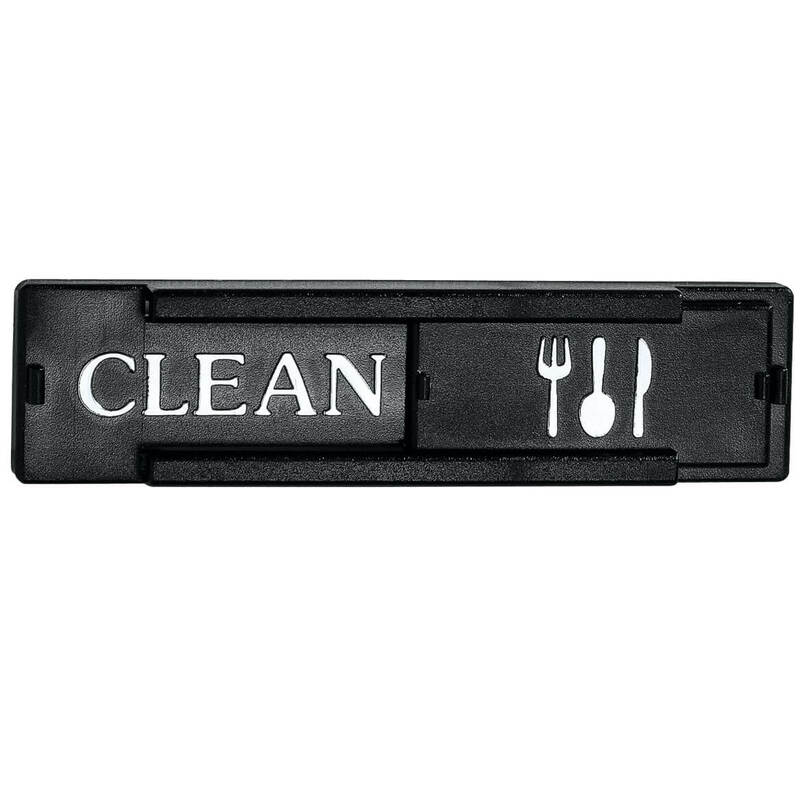 I ordered this item to see if it would help my family and friends know the status of the items in the dishwasher. My Granddaughter wants one so I ordered 3 in case someone else wants one. I already have mine. It would be helpful in the household. I think this will be helpful! I need this badly. I would like to help my husband by putting the dishes away but I never know if they are clean or not. I’ve been wanting one for a long time. I’m glad I found this one. My sister can never whether the dishes are clean or dirty. Bought one for myself and liked it. I have been searching for this type product and I chose this one because it's simple and straightforward -- not "cutesy". how does it stay on the dishwasher, is it a magnetic sign or sticky tape? BEST ANSWER: The user peels off the paper on back and sticks it to the surface of the dishwasher. However, I actually hot-glued a small magnet on back so I could remove it if I wanted. My family loves this sign, and I've bought it for friends with kids, too! It uses a sticky tape and has been working really well. It really does a good job in helping to remember if the dishes are clean or dirty. Great value for the price. Thank you for your quesiton. The Dishwasher Reminder does use an adhesive strip. We hope this is of help to you. It is magnetic and works well if I remember to set it correctly, lol. Does this dishwasher reminder come in white? BEST ANSWER: Mine is as shown, my dishwasher is white with black accents so it looks very nice on it. I put mine just above the handle and it looks like it came that way. Great product as sometimes I forget if they are clean or dirty,HA! Thank you for your question. This is the only option we sell. We hope this information will be of help to you. 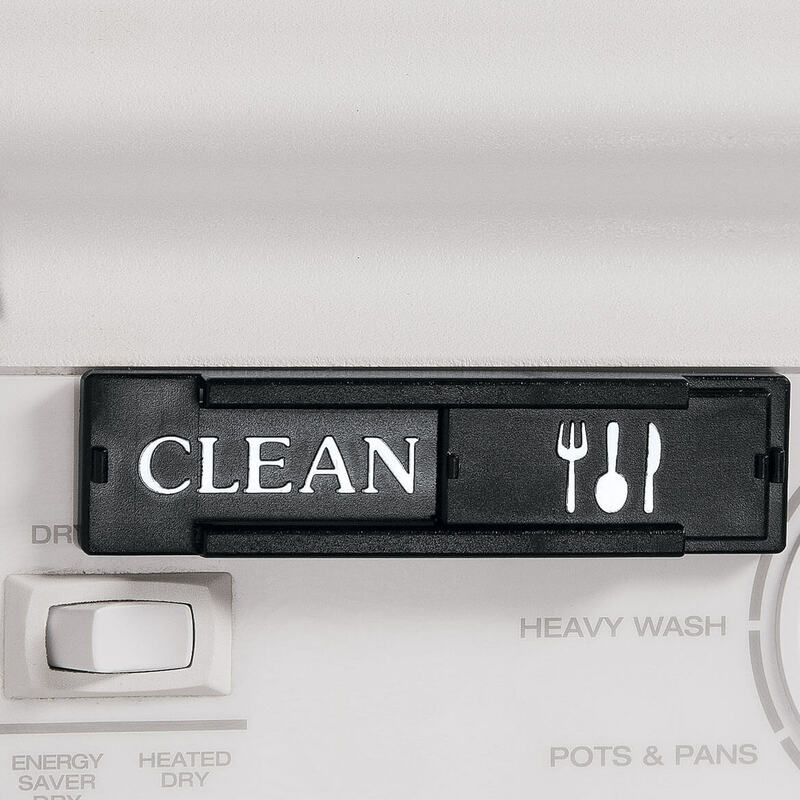 Is the "clean dirty sliding magnet" for dishwashers available in white? BEST ANSWER: Thank you for your question. This is the way we sell the item, no color choices. We hope this information will be of help to you.